That’s how many people lost their lives while riding a bicycle in Southern California last year. While far too many, that is a significant improvement over the year before, when 86 riders were killed on SoCal streets, and in 2013, when 89 people died riding their bikes. Meanwhile, 11 riders were killed in the City of Los Angeles in 2015, which is the same as in 2014. 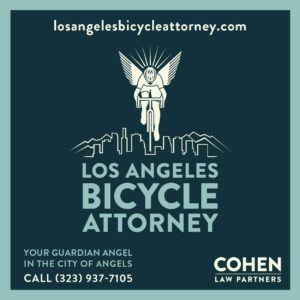 Of the 52 Southern California cases where there was enough information to reasonably assign blame, it was evenly divided, with cyclists at fault in 26 of the fatalities, and drivers at fault in the other 26. It should be noted that these stats are complied primarily through published reports, as well as other confirmed sources. It is likely that one or more fatalities may not have been reported, and therefore, not included in these totals. Not all amounts will add up to total since some factors, such as the time of the incident, are not always reported. Seriously, you don’t mess with the Marines. Roughly 45 San Diego-area mountain bikers learned that the hard way over the weekend when they were stopped by armed Marines, ticketed and had their bikes confiscated for trespassing on military property. The riders had evidently strayed onto the Marine Corps Air Station Miramar, formerly home to the famed Top Gun school before the base was transferred from the Navy to the Marine Corp. According to a thread on the mtbr forum, riders had received plenty of warnings that the trails were closed to the public, since they were close to areas where live fire drills are conducted. However, many riders complained that they were poorly marked, if at all, even though the Marines indicated notices had been posted on all trails and the San Diego Mountain Biking Association has been warning about the closure for months. The riders were escorted off the base, and forced to walk back to their cars or have someone pick them up. 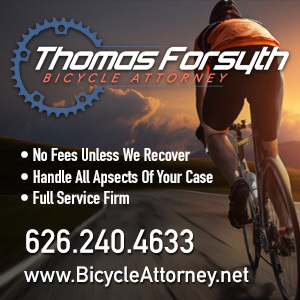 They can reclaim their bikes once the citations have been adjudicated and any fines paid. The Times reviews a sandwich shop just off the LA River bike path in Frogtown, where the dishes are named after public radio hosts. Cycling in the South Bay’s Seth Davidson issues his recommendations for the governing body for SoCal bike racing. A new parking structure in Old Towne Orange will include a bike plaza with bike racks and lockers. Sad news from Oxnard, where a teenager was killed while walking his bike along a train track. Bicycling talks with five cyclists — or maybe six, they can’t seem to decide — about how it feels to get hit by a car, and how it changed the way they ride. If riding your bike isn’t environmentally-friendly enough, Grist talks eco-friendly bike lube. Gear Junkie is the latest to discover the all-black company of bike-riding Buffalo Soldiers of the 1890s. Though someone should tell them quite a few non-elite cyclists ride more than 1,900 miles. Oregon district attorneys want to make it a felony to hit a bicyclist with a car, presumably intentionally. Boulder CO, a platinum level bike friendly community, is removing a pair of protected bike lanes, in part because of complaints from cyclists. An Iowa paper looks at how Minneapolis became a bicycling mecca and asks why not us? Eight years after a legally blind Columbia MO Army vet took up bicycling, he’s gained independence, improved his fitness and competed in his first triathlon. Chicago tries, and fails, to have all the bike lanes in the city declared recreational zones to avoid liability for failing to maintain them. Under that standard, all the streets would be racetracks. New York’s mayor agrees to reduce the number of horse drawn carriages in Central Park, while kicking out their pedicab competition. Thanks to Aurelio Jose Barrera for the heads-up. 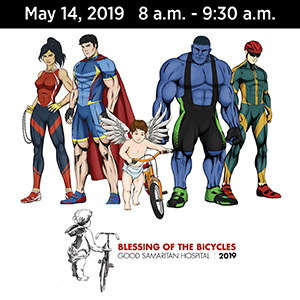 North Carolina boy scouts offer advice for aspiring cross-county charity cyclists after raising $35,000 in memory of a schoolmate who died of cancer. Rio, Brazil opens a beachfront bike path that the BBC calls one of the most beautiful in the world; the city plans to complete 450 kilometers of bikeways — roughly 280 miles — in advance of next year’s Olympics. A pioneering new stem cell treatment is delivering “miraculous” results, enabling formerly wheelchair-bound patients to walk again; a former triathlete is even able to ride his bike. Heartbreaking story of a young Toronto cyclist taking a tour through the Deep South looking for the roots of American music. And the half-assed investigation into his death that exonerated a truck driver who claimed he had committed suicide by riding head-first into the truck, while witnesses and evidence indicated the driver actually ran him down from behind. A British website looks at suits specially made for bicycle commuting. Denmark will install bike boxes at busy intersections to prevent right turn collisions. An entrepreneurial Egyptian couple build their own bike-borne sweet potato street food cart for the equivalent of just $255. The beat goes on, as a South African mountain biker is the latest cyclist busted for doping. The woman riding through the Southern Hemisphere to collect 1001 stories about climate change pauses to catch her breath in New Zealand. It’s one thing to give 110% effort; it’s another to get overwhelming support for bicycling when a whopping 156% of local residents respond. Do you really need a new law to clarify that bike riders have the right-of-way when they have the right of way? And what good is a cycling superhighway if a driver is going to tailgate you on it? I would like permission to reprint your snippet about the Marines confiscating mountain bikes caught trespassing on Miramar Air Station. 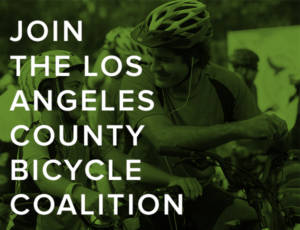 We would of course credit Biking LA and add a link to your site. By the way: I read your posts daily. Thanks for asking, Timothy, but there’s no need to. As long as you credit me as the source, feel free anytime. Thanks for compiling the bicycle fatality statistics. Here’s hoping our society can learn from our mistakes. My hope is that number keeps getting smaller each year until there’s no stats to compile.